Letting Kids Walk to the Park in Maryland: Legal or Not? If you’re wondering if it’s legal or illegal to let your kids walk to the park in Silver Spring, Maryland, the answer is yes. …in another section of the document, officials cited a county police directive requiring officers responding to neglect calls to notify CPS, remain at the scene, cooperate with CPS in an attempt to locate parents and take children into protective custody if requested. Obviously the problem is that “neglect” is left in the eye of the beholder, and sometimes that eye is wearing “Law & Order” contact lenses that see danger and mayhem where the naked eye sees only sidewalks and trees. The solution is to forbid what I call “Fantasy as Policy.” Just because an authority can imagine something gruesome or terrifying happening to kids, that’s not enough justification to find the parents guilty of endangering them. The danger has to be immediate, indisputable and likely. This solution would also work in cases when parents are investigated for letting their kids wait in the car. If the errand is brief and the kids are not broiling hot or in a high crime area, the chances of them dying are about the same as the chances of any of us dying while stuck in a car in a traffic jam. Kids die when they are left in a car for hours, not minutes. So to criminalize the mom who lets them wait while she runs in to pick up the pizza is “Fantasy as Policy” again – fantasizing an extremely danger and criminalizing the parent for not acting as if it were likely. What kind of parent lets her kids play at a place like this??? 38 Responses to Letting Kids Walk to the Park in Maryland: Legal or Not? Question 6 was: “What is the law and/or regulation that would give Child Protective Services the authority to hold in goverment care an unaccompanied child who has been encountered in an outside area as opposed to a building, car, or other confined space? I would be surprised if the “serious immediate danger” standard is a sane one, if applied sanely. But to say two kids walking around Silver Spring at 5pm in spring qualify as being in “serious immediate danger” is absurd. I hope the Meitiv’s lawyers can use that to prove that CPS acted illegally. Family Law 5-709(d) also says that if they remove a per that law, CPS has to have the kid “thoroughly examined by a physician.” Did CPS do that? Also why is CPS making this determination, alone, when it is the officer who has actual eyes on the situation (or alleged situation)? I get saying CPS has to sign off on taking the kid in. But frankly where are the checks in this system? It sounds like once a call is made, a single CPS agent can decide to have the kid taken, on their own accord. Combine that to the answer to question 8, that they have no time frame for when they have to review and decide if the child will continue to be held, or returned to parents. This system is so ripe for one bad decision, from one person, to just keep snow balling. Best wishes to the Meitivs, I hope they can force a change. “Fantasy as Policy.” really hit the nail on the head. My blog (still in its early stages) will be primarily about how the brain can get fooled and can become certain that the ‘fantasy’ are the facts. Isn’t it mostly babies and toddlers that die in hot cars and not children? Kids also die when they are taken out of the car and are walking through parking lots. Watch out Lenore, the Arizona people are going to show up shortly and insist that yes, it IS minutes, all over the world!! Whole police forces of Potter Stewarts. They know it when they see it. I left my son, 6, in the car on Sunday while I ran into the store. It was cloudy and in the mid 50s.Zero chance of him dying. We live in Maryland, on the edge. Wish me luck. If they keep this crap up, nobody will be having any more children. Then where are they going to get their taxes? Not just the kids. I left my dog in the car today while a grabbed a few groceries. About 60* and cloudy, with the windows open enough to get his whole head out. I still had second thoughts about whether some busy-body would call the cops. I’m sick of Nosy Nellies making me second-guess my choices. So, if anyone calls the police on the kids, the cop has two options — turn things over to CPS or just call the kids’ parents/bring the kids home. Does this mean than ANYONE who, for whatever misguided reason, feels uncomfortable seeing children without adults basically has the power to, in the best case, interrupt the children’s outing and have them escorted home in a police car, or in the worst case, get the kids taken by CPS? Insanely absurd. How about a third option: do nothing? Can’t a call ever just be classified as a false alarm (if not a crank call)? How about a third option: do nothing? Suppose you see a couple of kids walking down the street and you call the cops. The cops say, “Who cares?” And then those kids never return home. One-in-a-million happenstance. Or so it would be said. 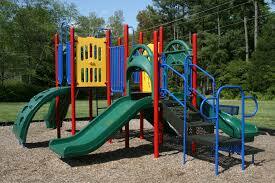 P.S., Who else here thinks the playground in the picture is kind of wimpy? In my mind, kids who are old enough to walk/bike to the park alone (so, school age or so) would probably be too old to want to play on that. If you ask me, I liked this country better when we were all a little less safe. On the what if the police don’t pick the kids up and something bad happens question, I’ll repeat what I’ve said before. Lets pretend we aren’t talking about kids. Lets pretend we are talking about a frail old person or couple who seems possibly senile wandering their neighborhood. Now if the cops just ignored that call, and something bad happened after. I would be furious, I would want the people responsible for that decision investigated and appropriately disciplined. I might even say something about the need to get off well padded back sides. Now if the cops went out and found out that the old person was completely competent. Knew where s/he was, how to get home, how to get help if need be, and was simply enjoying a little exercise and fresh air… and let the person go. The fact that something later happened I would take as a strange tragedy. And perhaps ask if there was anything subtle that the cops overlooked? If however they responded to such a call, by hauling a competent enough elderly person to a high security Alzheimer’s ward. Then proceeded to refuse to release the elderly person, until that person’s children promised to prevent mom/dad from ever walking alone in the neighborhood again. Then tried to justify it because something *might* happen, and the old person’s daily constitutionals had made people ‘concerned’ before. I would be absolutely furious. I would want the police department and elder abuse department cleaned out from top to bottom. I would work to get a new chief of police. I would want to unseat every politician who supported the unnecessary imprisonment of the old person. I wouldn’t just want a head to roll, I would want every head to roll. I hold the same standard for calls about children. The individual’s rights have a lot higher standing than any police department whining that they don’t want to be responsible for making a judgement call. If they don’t think they can trust their own judgement, if the police chief doesn’t think they can trust the officer’s judgment. The officer is in the wrong line of work. Nobody was hurt, but we can do a better job? That sounds perfectly in line with the “fantasy as reality” deal. The kids could have been hurt so even though they weren’t, we need to keep eyes on them at all times. I take my kids to the park so they can play a little more freely and I can relax a bit. I let them know where I am and then sit down to talk with a friend or, heaven forbid, play Candy Crush on my tablet. Really, why don’t they take it a step further and insist we wander around underneath our kids with a safety net because really, kids can get hurt when we’re watching them too. Sorry, @Havva, spelled your name wrong. I wanted to add that I was happy to see that most of the comments echo my sentiments and I imagine the feelings of this site. By “do nothing” I didn’t mean don’t investigate; I meant, once you see there isn’t a problem, leave the kids alone. The more I look at that article, the stupider it gets. Really? That sounds like a boondoggle, not a real job. This took multiple people not one, but two, presentations to report? Really? And you’re going to react in one second? And what’s “getting hurt”? Every thing that momentarily causes a child to say “ouch”? Just live previous generations of parents hooked their children on the stupidity of television. So the children might actually play when they’re not being stared at every moment? That this whole thing is a stupid boondoggle, make-work for a bunch of self-designated ‘social scientists’? Thanks for that link. It’s clear I need to pull my daughter out of her preschool now. When they go to the park, there are only 2 teachers to watch 11 children. The danger is unfathomable!!! Because we know that is representative of the entire nation. Sounds like a bunch of pedophiles looking for likely victims, doesn’t it? Mom glances at the cellphone, and they make off with a kid. Or a whole playgroundfull. “How about a third option: do nothing? Actually most sane police officers will tell you the reason they don’t “do nothing” is because there’s actually a legitimate issue that the nosy nelly who calls is going to take matters into their own hands and the last thing anyone wants is a vigilante getting involved with a kid. The cops also hate neighbour wars, they’d rather turn up the first time then have someone get butthurt and be calling dozens of times for every little thing. I didn’t bother to read the article that Havva posted, but I did read the comments. There was one self-righteous mom supporting the premise of the article but otherwise EVERY SINGLE COMMENT was mocking it and/or helicoptering in general. Lenore is making Progress!! It’s infuriating and utterly galling that insane research like that gets commissioned and funded. These guys are prime targets for a good, old fashioned Lenore rant. This crazy Milanaik lady “works” (if you can call it that) at the North Shore-LIJ Cohen Children’s Medical Center in Lake Success, New York. That’s on Long Island, a short drive from Lenore HQ. I vote she goes out there and chews her out in person. Think of the positive effect it “might” have on the outcome of an encounter between kids and police/cps if all Free Range Kids carried a Free Range Kids Card (like Lenore has posted here: http://www.freerangekids.com/wp-content/uploads/2012/07/free-range-red-v2.pdf ). You could use that one, or make your own with more specific information. If your child carries this card and can whip it out to show any authority figure, that could make all the difference in a time like ours when police and CPS feel pressured by society to “do something.” Since Free Range is becoming more well-known, the card might have even more effect than it would have a few years ago. The part of Havva’s article that bugged me the most was the recommendation to use a hands-free device if you want to talk on your phone. YOUR EYES ARE NOT IN YOUR HANDS!!! I get using a hands-free in a car — that allows you to keep both hands on the wheel. But in a park???? If you can’t keep your eyes on your kids while HOLDING your phone and talking, then how would that change if you were using a hands-free? This is the problem with much social science research… a very limited understanding or application of the scientific method. Good research tests a hypothesis in a rigorous and repeatable fashion and either proves or fails to prove that hypothesis. Too much social science research is really conducted just to attempt to use statistics and/or skew data in order to support whatever premise the researchers (or their financial backers) want to prove. 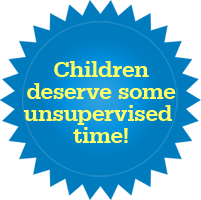 Toddlers who are still determined to put every loose object that they encounter into their mouths need that kind of supervision. Young children with a tendency to bolt towards the railroad tracks, river, or parking lot (one of the best playgrounds we used to go to had all three) need some supervision, but probably not to the degree that the article suggests. Beyond that, I’m there to enjoy the fresh air, and because my kids needed a ride to get there in the first place (we live in the country and sometimes they’re in the mood for more than trees and our own pond and stream.) And to provide first aid and/or a trip to the emergency room if there’s something that requires it. I’ve had to do that twice in 18 years of parenting. Other than that, they don’t need my intervention much, unless it’s to witness a spectacularly daring new feat of balance and/or jumping off of high things. If something happens, they’ll get my attention. @Kimberly–I think the rationale behind the hands-free phone at the park is, presumably, so that helicopter parents don’t have to interrupt their cell phone conversations to yank little Britney off the top of the monkey bars before she either falls off, or develops a sense of autonomy. This is an excellent post, Lenore! Yes. Fantasy should not be the basis for our policy. Our laws should be based on real, immediate, and serious risks, not on wild fantasies about what people might do more rooted in TV dramas than actual fact. @Havva, I shared the link about “distracted” parents with my husband, who does research into distracted driving. One thing he said was that we always have to be careful when talking about distraction that isn’t correlated with increased risk, such as in this study. There was no evidence that children were in danger when their children were looking away. We all can’t assume that just because a parent is looking at a child they are paying attention: it’s possible that, absent conversation, books, food, cellphones, or any of the “distractions” that keep people from focusing on their kids, they’d simply because lost in thought and no more aware of their surroundings than if they were doing any of those other activities. I’m also not sure why this study singled out cellphones, when conversation with another parent was the biggest distractor, and eating and reading were also up there. Can we imagine telling parents, “Do not bring a book to the park to read! Your child will be in danger!”? I mean, they may actually have said things like that in the decades following the rise of the novel, when people were suspicious of novel-reading, but today we’d think that was silly. But, since it’s a cellphone, any amount of paranoia is warranted. So, in other words if you’re black or the authorities just don’t like you for some other reason, then your kids go into foster care and you go to the slammer. If you’re wired in, then maybe the paper will write a story about what a wonderful parent you are. The message is the same: We MAY decide to screw you over, if you don’t kiss up to the schools, to the politicians, and to the cops. I too loved this country when it wasn’t as safe. I had a great childhood outdoors and still love the outdoors and walk around at night and early morning. In the summers by mother would kick us out by 9:00 and we wouldn’t come home until we were hungry or ready for bed. At the age of 11, I had a paper route at 5:30 every morning by myself which covered 6 miles on a bike for 90 minutes, best part of my day. No adults, just me, my bike and a quiet town. I still remember the satisfying ‘thunk’ as a well aimed paper hit the front door. But the work never stops. If I was that 10 year-old accompanying my 6 year-old sib – I’d be insulted. “Old enough” used to be a parental domain. And it was never universal. It was as variable as society itself, yet there were always commonly understood universal perameters, known and understood by most. Just a thought: There is something in the neighborhood of a quarter of a million kids injured and in some cases, killed – in cars, while attended by an adult…………………………………………….driving. One could well conclude: that cars are extremely dangerous to kids. Period. Yet children have never been more driven in cars, in the history of the planet. When I was a kid (from the age of 5, when my father got his first car – to 16) I was driven somewhere in a car an average of 2 to 4 times per MONTH. That’s right. Kinda raises the stakes, don’tcha think? Kids are that much more car-dependent because their parents are, and because we’ve made them that way. The fundamental and foundational basis of an economy. And of course……in all car-friendly (and very kid-unfriendly) environments – this provides by far the greatest public concern for child-safety. And rightly so. We don’t drive at all, the way we used to. Yet no-one really questions this. Inner city restrictions make driving thoroughfares a zoo. But suburbia bravely soldiers on. Subdivided to eternity. Rubber tires pounding that pavement, and not a kid in sight. Sidewalks (if they exist at all) for dog-walkers, only. And maids, nannies et all too poor for car ownership……and relatively few of them. I think the real issue is to return to the very idea of pedestrianism (which is by definition, what kids are: too young for divers’ licences……old enough to perambulate.) They spend their lives in cars. Living on the razor’s edge of national statistics. And yet they raised a shytestorm over a walk in the park. I will retire, to bedlam. Fond memories of paper routes. A little chilly in winter……but spring, summer, fall……..blissful peace and quiet. Such a luvly way to start a day. Reading news, headlines……knowing things before anyone else did. And for a rabid young fan – the sports scores. That was livin’ ! Cognitive abilities? I question the cognitive abilities of police and CPS who deem “unattended children” such a danger for…walking. I feel for all of the petite children who will be stopped and harassed for no reason. What about adults who look like children? I know many parents who have questionable cognitive abilities. Police in Maryland, with the the ridiculous riots in Baltimore, focus on REAL crime and leave innocent, healthy children alone! Stop profiling, it’s reverse ageism, and serves no constructive purpose to community safety. Maryland lawmakers should not be allowed outdoors without parental supervision.